Campbell Newman is on a publicity blitz to promote a new book about why he wasn’t really an absolutely hopeless premier at all, actually. Managing editor David Donovan attends the Gold Coast launch. JUST WHEN YOU THOUGHT you'd seen the last of him, Campbell “Can Do” Newman roars back into the news. Yes, the fairly recently dumped one-term Queensland premier has just completed a whirlwind three day, three city tour to promote a new biography — Can Do. By all reports, the book sheets all the blame for his political demise down to us – and the media – but certainly not to him. In advance of the official launch of the book in Brisbane on Wednesday (7/10/15), the tiny former Army major received a surprising amount of publicity because a local bookstore − the Avid Reader in West End − had refused to stock it. Surprising, because no-one in this trendy inner-city enclave was ever going to buy Newman's rightwing manifesto anyway. Nevertheless, it was a PR bonanza for the store’s canny and principled proprietor — as well, no doubt, for Newman himself. Then, Newman gained more press coverage at the Brisbane launch itself by continuing his ongoing tirade against his many perceived enemies. He had been most outspoken against the media, of course, which he attacked again in Brisbane, but this time his sights were focussed more on former anti-corruption Commissioner Tony Fitzgerald QC. Before January’s election, Fitzgerald had spoken out about Newman’s attacks on the judiciary and weakening of Queensland’s anti-corruption regime, which the QC had, through the Fitzgerald Inquiry, played a major role in creating. Newman, as you may recall, sacked the entire parliamentary corruption committee over its investigation into the bias and potential criminality of the head of the CMC, appointed an unqualified magistrate as chief justice of the Supreme Court, and brought in laws that massively increased the powers of police. According to "Can Do", Fitzgerald has shown himself to be biased against Newman because he hadn’t yet taken popular new Premier Annastacia Palaszczuk to task. What was Fitzgerald meant to take issue with Palaszczuk over? Well, Newman said she hadn't turned up to some Senate Estimates hearings. How that relates to Fitzgerald’s expertise in the law or fighting corruption is in no way clear. Based on these obvious contradictions, I decided to turn up to see this widely scorned figure speak at the Gold Coast launch of the controversial book, Can Do, which was written by Newman’s close friend and former cabinet colleague, vicious LNP smearer Gavin "The Dirt" King. Walking up the driveway into the ritzy Surfers Paradise Marriott just a little late for the midday Tea Party luncheon, I notice a lone protestor packing up his sandwich board. It reads ‘Not4Sale’ — a relic of the successful campaign launched by the Electrical Trades Union to combat Newman’s “Strong Choices” plan to sell off the State’s infrastructure, including its valuable electricity assets. Upstairs, I enter a pokey little function room on the second floor, containing a dais and six set tables of ten. I find a seat near the front. I am just in time for the formalities. The table I am at is half empty, but then so are several others, including the next one across the aisle. At that table, directly opposite me, slumps the main man himself — Campbell Newman. Newman is a good 12 yards away from where I am seated, but I soon discover he is a loud speaker and an even louder laugher, and so I can’t help but hear him yammer away to his table – which consists of Gavin King, Southport LNP MP Rob Molhoek and a few other unrecognisables − about various matters, including book sales. Surprisingly, I hear him say the first edition has been “sold out”. Really? Perhaps he means all the copies have been consigned. Also there, at a table at the back, sits famous dancer and local LNP MP "Mermaid" Ray Stevens, who holds court amongst a bevy of appreciative cronies. VIDEO: Rude Mermaid Ray Stevens goes aggro in the most juvenile fashion today at Nobby's Beach. http://t.co/UheV9xpLQh Amazing behaviour. At another table at the back, stoney-faced and taciturn, sits former Newman Government minister David Crisafulli. All in all, it is a rather desultory turnout of about 50 guests − mostly men in grey suits – which includes only two sitting MPs and one former parliamentarian — not including Newman and his smirking sidekick. The venue is definitely not abuzz and is most certainly not what anyone would call a “grand affair”. After a few painful speeches from the hosts – the Gold Coast Chamber of Commerce – and another from their main sponsor, the Bendigo Bank, all accompanied by the usual windblown chicken and veal, at last, Sancho Panza struts up to the podium to introduce his liege lord. Panza − or rather, Gavin King − is a tall, lean, dark-haired man in his late 30s, who carries himself with the air of someone who thinks he has just said something extraordinarily amusing. After muddling his way through a few attempted jokes, King turns his attention towards the guest of honour. The former News Corp “journalist” soon begins railing against the vast unfairness of Newman’s premature demise. Newman, he says, was a tireless servant of the public who had been taught his civic duty by his parents, who were both Liberal Party Federal ministers, don’t you know? The thought that the dynastic nature of the Liberal Party elite may not necessarily be seen as a positive part of our democracy does not appear to have occurred to King. The book is meant to “start a debate”, he says. The book is also, says King, about telling a history that school children won’t learn at school. 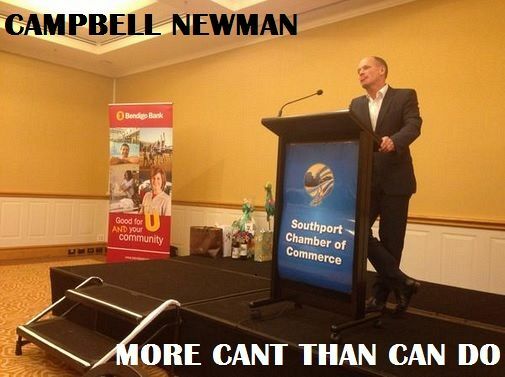 At last, Campbell Newman fronts the [ahem] crowd. Newman is a diminutive man — rapidly diminishing. Small in stature and further stooped over the dais, he speaks fast, without pause and entirely through his nose — a veritable wall of whine. He has a lot that grieves him, regrettably. Dignified as ever, Newman marks his respects to the current Queensland administration. “Nothing is happening that should be happening,” he moans. Newman says he has a whole hallway of political books at his house that he uses as “manuals” (clearly, none explain the separation of powers) and that he doesn’t like politics. He then confusingly follows up by talking about his family’s long historical ties to Sydney. Since 1854, he says — something that will surely further enamour him to parochial Queenslanders. Finally, after digressing to an anecdote about his father voting for Gough Whitlam, then promptly standing for the Liberals at the next election (sure sure), he starts talking about what we came here to find out — why Campbell got so rudely kicked to the kerb by the Queensland voting public. “I’m not here to say the media were to blame for the loss,” he laments, “there were other reasons." Not many, though, because according to the pint-sized former premier, apart from the media’s role, there was also “the attitude in the community”, “social media” and, almost as an afterthought, “the politicians themselves”. All Newman did he did because he was “concerned for Queensland”, he claims. By “reform”, it is pretty clear Major Newman means “do as he's told”. Campbell was going to fix everything (even social security, it seems, despite it being a Federal responsibility) but, wouldn’t you know it, all the haters cut him down before he had a chance — the pack of bastards! And who are the haters? Well, the commercial media for a start. They are just looking for conflict and cheap grabs, says Incandescent Newman. This is all related to reality TV, somehow. The only outlets that cover issues, in Universe Newman, are the ABC and The Australian. New media like IA simply don’t register in the Brave Newman World. Social media is also bad. And terribly nasty! It is just an echo chamber where people love to hate other people just because their best mates hate that person. Or something. And 140 characters is not enough to develop the ideas and concepts required to solve the problems of the world — which was exactly what Campbell was doing, of course, before he was so unfairly cut down in his prime. As for the attitude of the people? Well, what can you expect from them, after them all being forcefed reality TV and hepped up on social media? He changes subjects disconcertingly swiftly. As for the mistakes politician’s themselves, well, Campbell never quite gets to that. Maybe he ran out of time? The closest he comes is that he “tried to do too much”. Yes, he was too much of a reformer and we − the poor bovine electorate – were just too dim to appreciate what he was trying to do, too dull to even just bask in his brilliance. Yes, Campbell’s tragic failing was that he was much, much too ambitious for us mere mortals. Finally, Campbell stops talking and there is a question and answer session that also includes oily Gavin. The questions from the white-shoe brigade in attendance are, of course, predictable Dorothy Dixers and the answers are exactly what you might expect to hear from two flat track bullies. Totally missable. Mr Newman, you have blamed the media for being a major part in your downfall, yet when we turned up to vote in January, voters were met by a front page of The Courier-Mail, plastered by your party as bunting, absolutely everywhere the eye could see, scurrilously linking Labor with bikies. The Courier-Mail, Queensland’s only metropolitan newspaper was, indeed, a permanent LNP cheer squad throughout your time in power and did everything possible to aid your re-election. Given the massive free kick this provided, how much credibility can you possibly have in accusing the media of being biased against you? Wasn’t your problem not the media, but the fact you ran an incompetent, dysfunctional, arrogant and undeniably corrupt Government? Isn’t the problem that you were a poor leader who is now too weak to accept responsibility for your many profound failures as premier? Don’t expect this shallow narcissist, or his smarmy biographer, to be answering this question anywhere in their risible piece of fan fiction. That would be far too close to reality for them. I walked out of the event shaking my head. I did not buy the book. If you would also like to not buy Newman and King's book, you can visit the Avid Reader bookstore at 193 Boundary Road, West End, 4101. You can also follow David Donovan on Twitter @davrosz. I can't believe anyone would write a column about a progressive bookstore not stocking a far rightwing book. Not going to sell there anyway. Back to reality. Subscribe to IA for just $5.